Late last year, NASA announced plans to develop its next generation launch system. As the space agency's latest renderings show, this monstrous rocket will truly be able to take us to Mars — and well beyond. Called the Space Launch System (SLS), it's poised to be the world's most powerful launch vehicle. Currently under construction, it will enable human exploration of deep space, including asteroids, Mars, Jupiter, Saturn, and locations beyond that. Indeed, NASA claims that the system could make "outside the box" science missions possible. Can you imagine what this thing will look like when it takes off? The first launch is scheduled for 2017. During that seminal test flight, it'll lift 70 metric tons (77 tons) of payload into low-Earth orbit, almost three times what the space shuttle could carry. Once that's accomplished, NASA will modify it such that it can carry 130 metric tons (143 tons) — more weight than any rocket ever has carried in history. To put that into perspective, the Space Shuttle could carry objects the size of a school bus. "With SLS, you can design a spacecraft even larger than the space shuttle that carried Hubble," noted Steve Creech, assistant program manager for strategy and partnerships for SLS. "It's going to open up an entirely new way of thinking about how we plan and design planetary science missions." 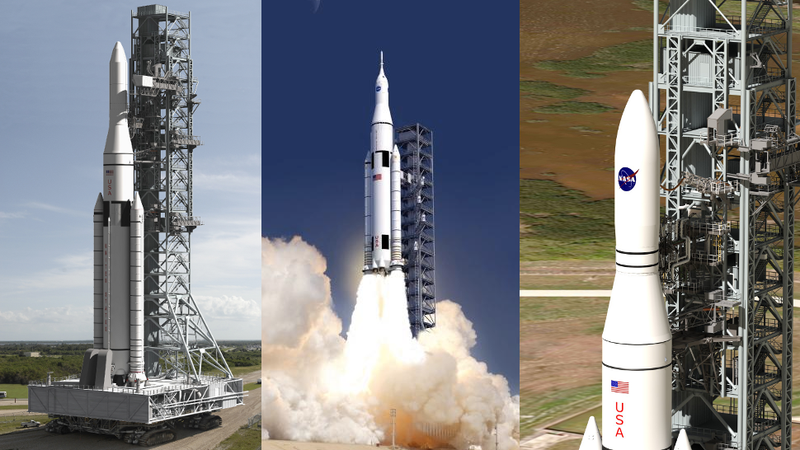 In addition to human exploration, SLS will have a wide application in several other areas, including space science. For example, it could send larger scientific spacecraft with more instruments to far off destinations with reduced transit times. Creech noted that a "Mars sample return mission...could be flown using only one rocket instead of three. But for other destinations, SLS lets you do things we could only dream of before – like collecting samples from the geysers of Saturn's moon Enceladus." NASA is also evaluating the potential benefits of launching deep space robotic spacecraft, such as the Europa Clipper (a proposed mission to one of Jupiter's icy moons) on the SLS rocket. The space agency has crunched the numbers to figure out if the rocket could enable spacecraft to fly direct trajectories to our solar system's outer planets without having to rely on time-consuming gravitational assist. When considering the Europa Clipper, for example, the travel time could be reduced to less than half of what it would be using other launch vehicles.